In today’s world, cell phones, pagers, iPods, computers, video games, and the like are as common a part of life as food and sleep. For the most part, these things are a distraction, and in case of video games, an outright form of escapism comparable to drug addiction. Today’s youth are especially preoccupied with video games, spending countless hours on Xbox Live or the World of Warcraft, working with other gamers worldwide on quests to destroy goblins and liberate office buildings from zombie infestations; this time could be better used for homework, personal study, exercise, or productive hobbies. Video games have become such an integral part of young people’s lives that they have even led to fatalities among dedicated gamers. One woman essentially drowned herself in a contest to win a Nintendo Wii for her children by drinking gallons of water and holding in her urine (whoever held it the longest would win). But what if there were a video game that had an educational significance, and a racial one at that? What if there were a video game that subliminally opened the player up to issues of race, politics, and culture? I believe I have found just such a game, as I myself have enjoyed it for many hours at a time over the last few years — I’m in my early twenties, so give me a break — and have had a chance to dissect its contents. It is not a single game exactly, but rather a series: The Elder Scrolls  (TES). The setting, or “universe” of the TES series is the fictional world of Nirn. Nirn is like Earth, having numerous continents and oceans; every game in the series takes place on the continent known as Tamriel, which is populated by a multitude of sentient humanoid races that hail from their own respective countries and kingdoms (e.g. the Nords of Skyrim and the Argonians of Black Marsh). Tamriel is currently ruled over by the great Cyrodiilic Empire which resembles Ancient Rome in its people, language, material culture, religion, and cosmopolitan social structure, among other things. Though it boasts the most powerful military force, the Imperial Legion, Cyrodiil is a waning power, beset by continual internal threats that demand the intervention of the game’s players for resolution. From "The Elder Scrolls" IV: "Oblivion"
Racial themes permeate every aspect of TES games. At the very beginning of the game the player must construct a basic identity for his character: a name, class (knight, mage, assassin, etc. ), gender, and race, among other things, comprise this identity. There are nine playable races, and interestingly enough, each one bears notable similarities to actual races in our world. Not all races in the game are human, however. The peoples of Tamriel are divided into Man, Mer (Elves), and different bestial races. The subspecies of Man include the Nords, a tall, robust, fair-skinned people who physically and culturally resemble Nordic Vikings; the Imperials, or Cyrodiilic peoples who bear Greco-Roman sounding names and resemble White Mediterraneans; the Redguards, an African-looking people who even have African-American sounding names (e.g. Trevond); and the Bretons, a very short and pale-skinned mix of Man and Elf with French-sounding names. Among the Elven peoples come the Altmer, or “High Elves,” who are a tall, golden-skinned, Aryan-like race that sees itself as superior to the other races; the Dunmer, or “Dark Elves,” a xenophobic and deeply religious group that reminds one of the ancient Hebrews (in no small reason because they were said to have departed from their proto-Elven kin under the leadership of a prophet who felt that they needed the guidance of different gods); the green-skinned and monstrous Orsimer (Orcs); and the Bosmer, or “Wood Elves,” who live in tree-top villages and embrace a pantheistic way of life. Each of the above has a genetically determined set of racial traits. 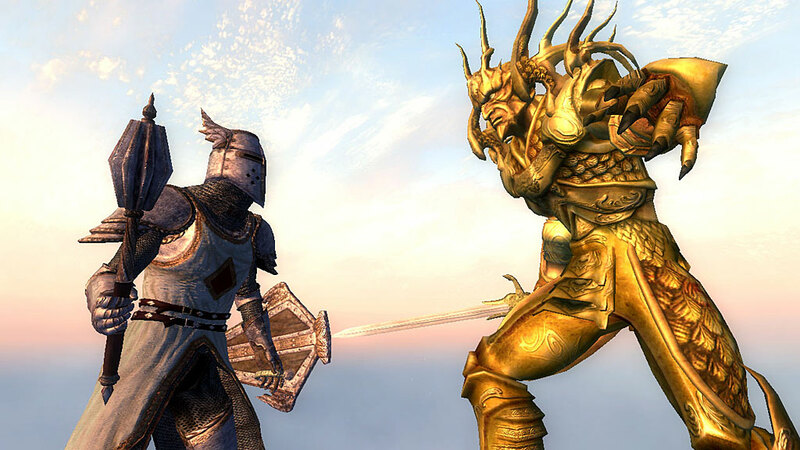 Each has a unique “special power” that the player can use for defense or attack (e.g., Bosmer can command animals to assist them in battle, while the folk-oriented Dunmer can call forth ancestral spirits). Some races are more gifted in the magical arts while others make better warriors; some have high resistances to diseases and elemental attacks while others are severely weakened by them. To give a specific example, the reptilian-humanoid Argonians can breath underwater while other races have a limited amount of breathing time while submerged, after which their health is impaired. All of the above is presented to the player within the first five minutes of game play. In choosing their character attributes the players are immediately opened up to the concept of racial differences. The rest of the game is saturated with issues of race and culture. 1. They have a very xenophobic culture that precludes them from friendly relations with other peoples, whom they refer to collectively as n’wah (sounds rather Semitic). As a result of these history-based inter-ethnic relations, the player’s race determines how other characters feel about him. If characters have a negative attitude toward the player they will refuse to impart bits of information that are crucial to completing the game. The player will then be forced to bribe them with money or manipulate them verbally (a skill that is governed by “Personality” points, which can be increased as the player gains experience; the starting number of points, however, is determined by the player’s race). By the Nine Divines, you’re an ugly one. But then, all Orcs are ugly. The most repulsive race in all of Tamriel, really. At least you’ve got that brutish strength, huh? Must be nice to just rip someone apart like some kind of monster. Oh, but you must be the one Orc weakling, huh? Captured by Imperials. How pathetic. You’re going to die in here, Orc! Like an animal in a cage! Enemies at later points in the game will also hurl racial insults at the player: “All you Elves/Humans are the same: all flash and no fury!” If the player is in combat with an enemy of the same race, the latter will sometimes cry “You’re a traitor to your own race!” One would turn a lot of heads for uttering those words in the real world, especially if one is white. Nevertheless, such barrages constantly remind the player of racial differences, which is significant even if the message comes from a fictional universe. Racial verbal exchanges are not always negative. 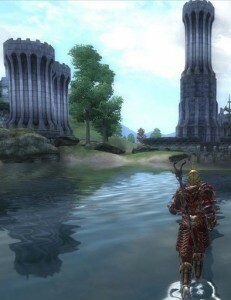 In Oblivion the player will often be addressed as “brother” by members of the same race as he passes them in the streets of Cyrodiil; these characters will also have a more positive disposition towards the player, making them more likely to assist him during missions or sell goods for cheaper prices. After much analysis of living specimens, the Council long ago determined that all “races” of elves and humans may mate with each other and bear fertile offspring. Generally the offspring bear the racial traits of the mother, though some traces of the father’s race may also be present. It is less clear whether the Argonians and Khajiit are interfertile with both humans and elves. . . . Khajiit differ from humans and elves not only their skeletal and dermal physiology — the “fur” that covers their bodies — but their metabolism and digestion as well. Argonians, like the dreugh, appear to be a semi-aquatic troglophile form of humans, though it is by no means clear whether the Argonians should be classified with dreugh, men, mer, or (in this author’s opinion), certain tree-dwelling lizards in Black Marsh. The fictional world of Nirn has an exhaustive history that can be researched through in-game books and dialogues between characters. What is significant to the white racialist about this history are its countless elements of Indo-European mythology and mythical conceptions of racial genesis. The history of Nirn, particularly its continent of Tamriel, is cyclical like the history of our world as viewed by the Ancients and later by Oswald Spengler and Julius Evola. Rather than following a straight line of events, Tamriel has gone through a series of “Eras” that each represent a new stage of civilized development. The transition from one phase to the next usually entails a step down from archetypal perfection, a view also held by the ancients. In the beginning was the Dawn Era where the archetype of order, Anu, clashed with the forces of chaos represented by Padomay-Sithis over the love of a celestial being named Nir. The battle caused the universe, the stars, and a multitude of deities to materialize. This bears a striking similarity to the Nordic understanding of cosmogenesis in which the ice of the realm Niflheim converged with the fires of Muspelheim in a middle space known as Ginnungagap, which caused the universe to explode forth. In fact, the order-chaos dichotomy in general is a theme that pervades virtually all Indo-European origin stories. One of the gods born from this cataclysmic event was Lorkhan, also known as the “Trickster-Deity.” The spelling of his name along with his personality suggest that his role was inspired by the Nordic god Loki, who was notorious for malevolent knavery (e.g. he fooled the other gods into slaying Baldur, one of their most beloved kin). In any event, Lorkhan ultimately tricked half of his divine kin, the Aedra (a term bearing notable similarities to the Nordic Aesir and Hindu Asuras), into constructing a sentient world at the expense of their own immortality; the result was the Earth-like planet known as Nirn. Now sapped of their divinity, the gods were forced to dwell in their new realm as imperfect demigods. Which the Celestials call the Silver Years. Nature grows weaker than she was before . . .
And mark our Actions, good, or bad, below . . .
Those demigods who did not enter the sky ultimately degenerated as they begat further generations of beings through reproduction. The inevitable result was the birth of the Ehlnofey, or the antecedents of both Elves and Humans who claimed the island of Aldmeris as their primordial seat. The birth of this race officially ushered in the Merethic Era. Shortly thereafter, the Ehlnofey diverged into separate races: the Aldmer, or proto-Elves who remained on Aldmeris, and the Nedes, or proto-Humans who emigrated to a new continent called Atmora. For various reasons the two ultimately reconnected on the continent of Tamriel and quarreled. What happened to Aldmeris and Atmora according to the in-game history books betrays another Indo-European mythic theme used by the designers: lost continents. Aldmeris was said to sink beneath the sea for unknown reasons (likely magical), forcing the Aldmer to settle in Tamriel. There they splintered off into the miscellany of Elven races discussed above. This story invokes the mythical account of Atlantis from Plato’s Timaeus and Critias, the continent “beyond the Pillars of Hercules” that was submerged by metaphysical causes. Meanwhile, Atmora was said to have frozen over and become inhospitable, which forced the Nedes to migrate into Tamriel and diverge into the multitude of human stocks. In this we find a parallel event in the Zoroastrian Zend-Avesta where the primordial Airyano Vaego is destroyed by the “fatal winters,” forcing the first humans to flee under the leadership of King Yima; among the ancient Greeks this primordial seat was known as Hyperborea or Thule. For many centuries the Elves were the dominant race on Tamriel, having erected grand civilizations across the continent and enslaving the Men and beast-folk (the animal-like races that were created when Nirn came into being) for manpower. Like many empires, the Elves became decadent, suffered intra-racial discord, and were overthrown by a human slave revolt. This event marked the beginning of the First Era and the dominance of Man under the Cyrodiilic Empire. Julius Evola, the Italian esotericist, comparative mythologist, and founding father of the European New Right, referred to such a development as the “regression of the castes,” in which a lower stratum of society seizes power from that directly above it (e.g., the merchants surmount the nobility) and thus completely alters the cultural style of that society. From the First to the Third Era the Imperials would wax and wane in power, but with the passage of time came ultimate decline, as it does in any human civilization. The Third Era ends with the Oblivion Crisis (the central plot of TES IV: Oblivion), in which hordes of Daedra (the gods not tricked by Lorkhan) spill into the realm of Nirn from the chaotic dimension of Oblivion and attempt to destroy Tamriel. The game is completed when the player brings the empire’s crown prince (voiced by actor Sean Bean) into the capital city, where he is transfigured into the avatar of another deity and obliterates the hellish invaders. In this sequence more Indo-European motifs are found. Firstly, the final battle between the forces of chaos (Daedra) and the forces of order (the Empire and its divine patrons) at the close of an Era is similar to the Nordic Ragnarok, when the Aesir engage in an apocalyptic war with the Vanir that leads to a radically new period of human existence. Secondly, the concept of an avatar acting on behalf of the gods and defeating chaos is clearly inspired by Hindu mythology. Next to the complex metaphysical themes are more simple aspects of European mythology: the existence of Elves and forest-dwelling sprites, the ability to don legendary armor like mithril and adamant, brewing magical potions, raiding caves and slaying goblins, going pound for pound with a troll, looting treasure, rescuing damsels, pursuing necromancers, dueling with undead legions, freeing the specters of tormented souls, crusading for relics, saving kingdoms, and the like — all are elements of the heroic spirit that permeates Celtic, Germanic, and Classical folkways. Constant exposure to them in the world or Nirn cannot help but generate interest in their real-world origins. Maybe I am just a nerd who gives too much credit to a form of modern entertainment. Be that as it may, one cannot deny the value that TES holds for white racialism. Of critical importance is that this game appeals predominantly to intelligent white people (with a few Asians thrown in). Being young myself, I have had a chance to observe the habits of American youth. One thing I have noticed is that the plebeian-minded simpletons always contented themselves with sports games and shoot’em ups, whereas the truly intelligent kids always go for role-playing games. Even if you went back in time to the 80s, before video games were as prevalent, you would see the student council members, chess club chairmen, math geniuses, and other future leaders of society spending their Friday nights slaying goblins and casting lightning bolts in the board game Dungeons and Dragons. Now, with TES games, bright white youth are being overtly and covertly bombarded with racial concepts and Indo-European cultural themes. From the first five minutes of the game to the very end, they are exposed to a steady barrage of racial differences, physical anthropology, medieval Gothic architecture, feudalism, Indo-Aryan myths, and Greek and Nordic myths — a subliminal course in Indo-European humanities. For whites who care about our cultural legacy and genetic future, perhaps TES games will prove a useful weapon in our occult war against the Daedra of our world, that is, multiculturalism and decadent modernism. Other role-playing games are also significant tools in the battle for young minds. Games like the Final Fantasy  series, Secret of Mana  , World of Warcraft  , Chrono Trigger  , Neverwinter Nights  , and Warhammer  are saturated with ancient, medieval, and archaeo-futuristic  themes of European inspiration. In playing such games our youth might very well take an interest in the racial and cultural history of their people, then put down the in-game books and pick up some real ones about who we are.